Tech Readers » What is 127.0.0.1 IP Address? April 23, 2019 7:41 pm You are here:Home PC & Web Knowledge Base What is 127.0.0.1 IP Address? The IP address of the user’s computer is a special IP address and is called ‘a loop-back’ address, local host or simply ‘127.0.0.1’. The loop-back address which is also the top level domain has only one end point and allows a user to access a shared global file system via a browser. It prevents conflict with remote addresses by identifying the current local computer kept at the DNS top level. All the computers connected to the internet have a unique IP address, which allows the internet to identify them but each machine has 127.0.0.1 reserved for use when there is the need for communication with a network service running on the same computer. Whenever there is a website request from a user, the web browser uses a local IP file called a Host file to first locate the site on the user’s computer. The browser then redirects a proxy server or a remote host to search for the IP address only when it is not found on the user’s computer. Through the 127.0.0.1 protocol, a local computer’s TCP/IP resources can be accessed by network utilities and software. All messages sent to this IP address are automatically returned to the TCP/IP stack’s receiving end. 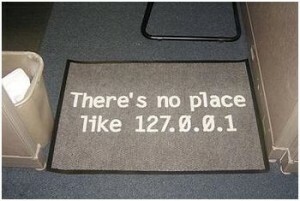 All IP addresses between 127.0.0.1 and 127.0.0.8 are usually engaged as Internet loop-back addresses. According to the Internet Society, “A datagram sent by a higher level protocol to an address anywhere within this block should loop back inside the host. This is ordinarily implemented using only 127.0.0.1/32 for loopback, but no addresses within this block should ever appear on any network anywhere.” Therefore, it is clearly obvious that the loopback address itself cannot be used by any computer connected to the Internet or a TCP/IP based network to identify itself on the Internet. Local host is very useful for testing whether the network interface card of a machine and TCP/IP implementation are in proper working order. This can be done by sending a ping request to 127.0.0.1. A website developer may also test the developing site without having to connect and upload it to a server. This is achieved by simply testing the site on http://localhost. Many beginner Internet users may be fooled into believing that they are “hacking” a remote computer when they access the 127.0.0.1 address. Being inexperienced, the user is unaware of the fact that the address loops back into the host machine and thus becomes the victim of a commonly practiced joke.